A little creativity goes a long way for someone like me. I feel like recently, I’ve been drowning in a pool of monotony. When there is no spark of creativity, I shut down. There are days my depression rears its ugly head and I can hardly get off the couch long enough to care. You’d think that a blog would be enough. But for someone like me, I need some sort of creative inspiration in life to give me something to write about! It’s like that almost every. single. day. (insert facepalm) Sure, on Thursdays we head to the softball fields where I get to watch the BF be a stud. And some weekends are spent by the pool with his family. But, those aren’t enough to make up for the lonely repetition I live with during the rest of the week. I needed a project. Something creative and artsy to help get me through the monotony of scrolling job boards. And doodling in my bullet journal wasn’t enough. I needed something measurable with a start and a finish to provide the feeling of progress, accomplishment. A few years ago, my sister introduced me to her favorite “blank canvas” at the time: a plastic cooler. Together we painted one for our old high school football team to keep on the sidelines during practice. And as a girl who grew up on the field and is still an avid sports fan, I love this canvas. After the one we did together, I pulled together some iconic images of my all-time favorite team. (Notre Dame football… it’s like, borderline obsession at this point.) I made myself my own ND cooler. It’s a hit at every party/event I take it to. And, when I pulled it out of my car to tailgate at my first ND game, well… the people in the lot couldn’t get enough of it! I decided that another painted cooler would be just what I needed to get out of my rut! 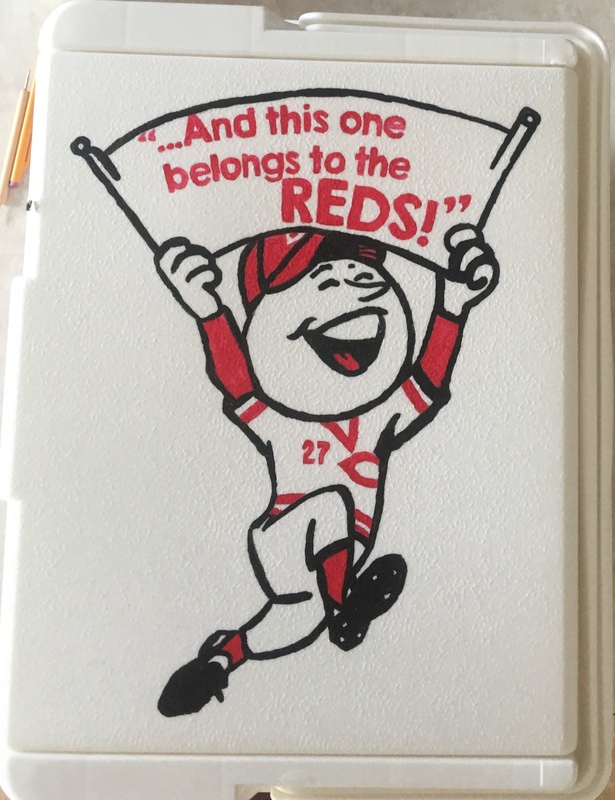 Growing up in Cincinnati, my BF and his family are huge fans of the Cincinnati Reds. 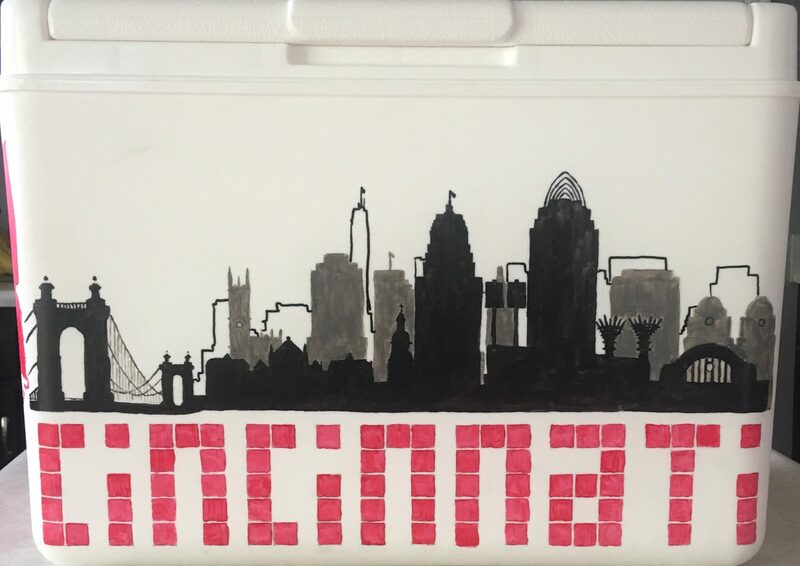 While the Washington Nationals will always hold my hometown heart, I figured this cooler should be a Reds theme. After all, they did play host to my 30th birthday back in April. I gathered my first set of supplies, conceptualized the design, created the design on my computer (for easier scaling), and I was off! 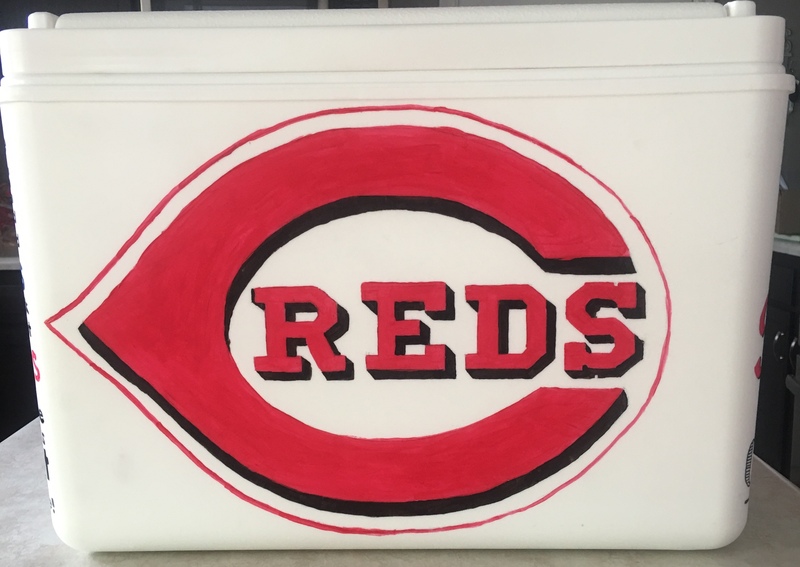 After a day of sketching the graphics onto the cooler and a trip to Michaels with the BF to pick the perfect shade of Reds red, the project took off! All in all the actual painting of the cooler took about 3 days. 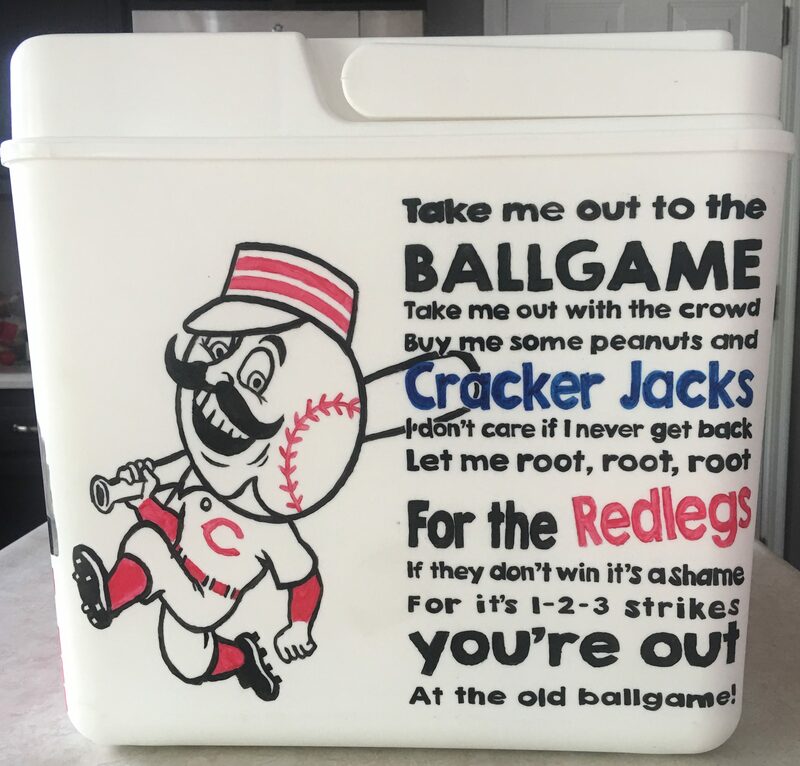 The lyrics to “Take me out to the Ballgame” were a major pain in my… WRIST! But, the cooler is all sealed up now and ready for my boyfriend to sport all over town! 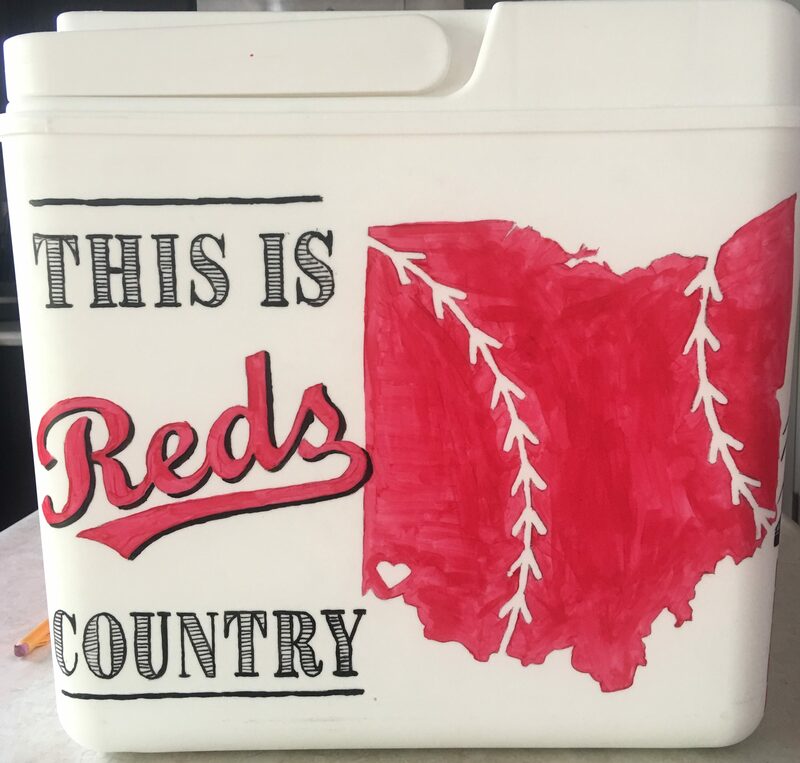 What would you want on your own handpainted cooler? Sports teams/images? Hometown images? Military/Police? I’d love to get some input so I can start putting together an “arsenal” of graphic ideas. I’m working on an Etsy store name too… What do you think? Leave me a note in the comments below!